Simply Baked small party picks are the perfect way to serve small hors d'oeuvres or finger food at any occasion. 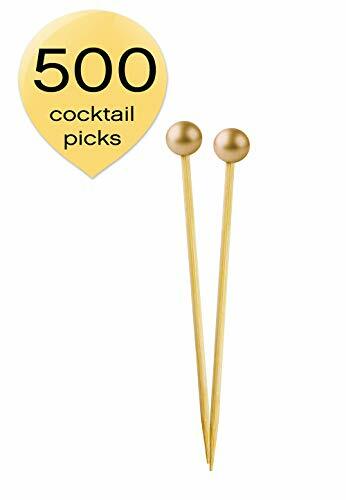 Use them to serve fruit skewers or mozzarella, tomato and basil sticks. Or leave a cup of picks next to the cheese tray, bowl of Swedish meatballs or jar of olives so fingers don't actually touch the finger food! they look great in a cocktail with olives for your martini or a few raspberries in your raspberry ginger fizz. The colors are bright and versatile and coordinate with the whole line of Simply Baked entertaining products. The small party picks are 3.5" long, food safe and disposable. They are not oven-safe, so be sure to put any hot food on the picks just before serving! Simply Baked started with two entrepreneurs, a belief in artful entertaining and a baking cup. Since then, we have become a leader in stylish, affordable and distinctive products for elegant entertaining every day! here at Simply Baked we believe in giving back. We support many children's causes and employ special needs individuals from our community of Bend, or. We also make every effort to support domestic production and hire local professionals. We hope you like our philosophy. We appreciate your generous support! If you have any questions about this product by Simply Baked, contact us by completing and submitting the form below. If you are looking for a specif part number, please include it with your message.